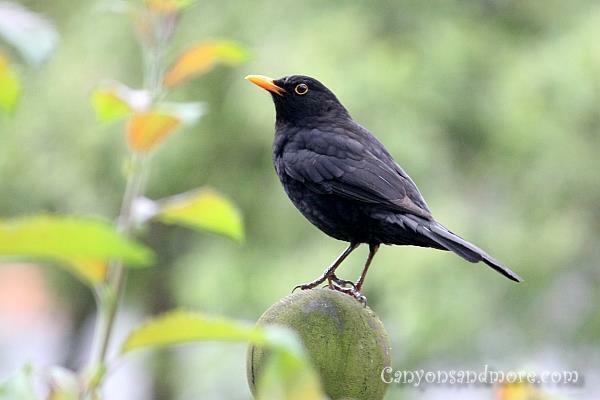 The blackbirds often frequent the yard throughout the year. The males are quite abundant and such proud birds with their pretty black feathers. In spring, during mating season, they sit on the tree tops or on the roof tops and sing loudly and lovely to mark their territory. 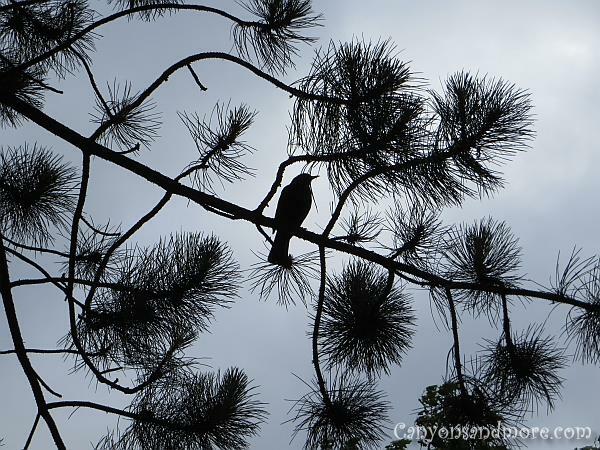 Especially during the early morning and in the evening around sunset, you can hear their beautiful song. At the same time from these locations, they can see if any predators are approaching. When one is in sight, they simultaneously give warning calls which echos through the whole area to signal the threat. 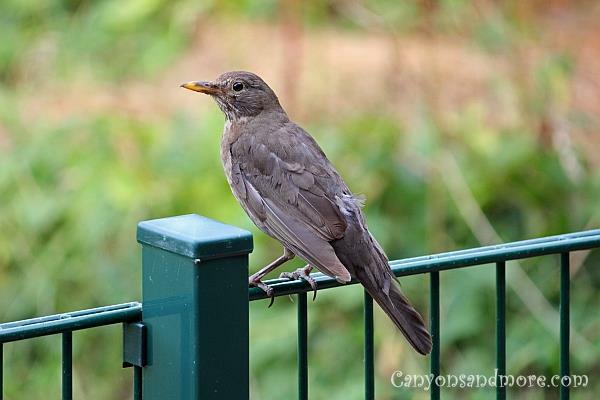 Blackbirds are very common in our area and each spring and summer, we enjoy watching the young and helpless birds follow their parents around. 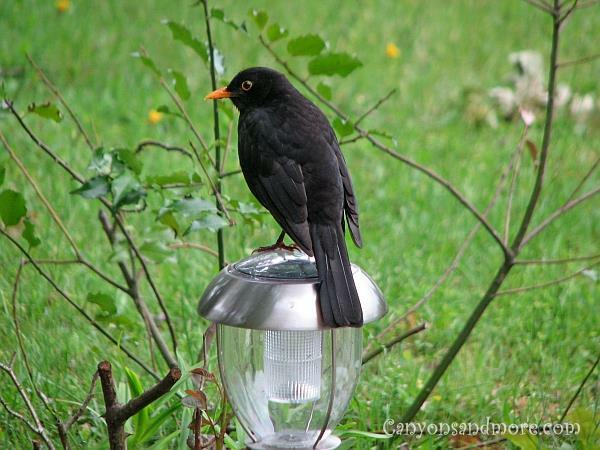 Blackbirds are mainly ground birds. When left alone, the young birds have a call which cannot be overheard. It actually sounds like like they are in trouble but they are only calling after their parents, that are in the immediate area searching for worms to feed them. One can assist the birds by shooing the neighborhood cats away. Cat owners could let their cats out for a shorter period of time during breeding and nesting time. Here, the cats constantly prey on the young birds which are simply to slow and unexperienced to escape them. It is sad enough that many of the birds already fall victim to martens and birds of prey such as the goshawks in the area. Husum is known as the “grey town on the sea” by the German author Theodor Storm, who also was born in Husum. If you visit Husum during the month of March, grey is not the color you will see. You will think purple if you visit the castle grounds. The town is famous for its celebration of the crocus flowers. You will find millions of crocus flowers around the castle there. On the particular day that the photo above was made, the whole field was full of black birds that seemed to be enjoying the day just as much as the festival visitors. 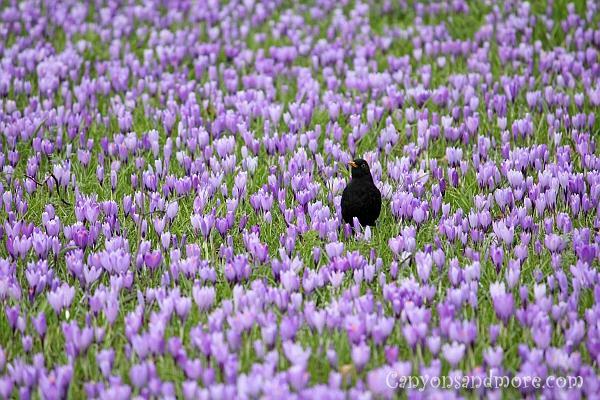 This particular blackbird was the star of the show and enjoyed its special place admist the beautiful blooms. Doesn’t he look so proud standing there? From this fence Mr. Blackbird has a great view over our yard. He keeps watch and warns when he sees cats approaching. 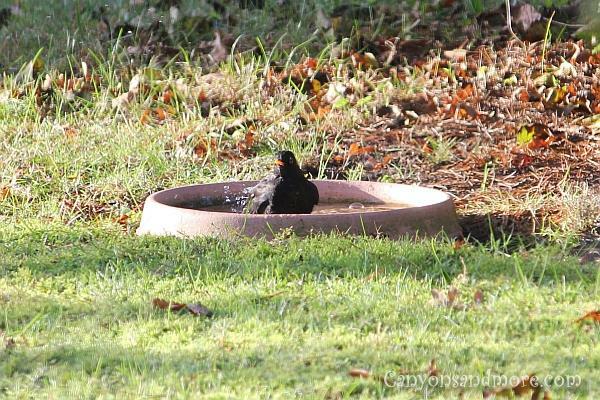 This gorgeous male blackbird had made his home in our yard (and in our hearts). The past spring and early summer months, he bred with his chosen female and while she is waiting in the nest for the eggs to hatch, he picks high places such as roof tops or high trees to keep guard for preditors, especially the local cats. When he sees oncoming danger, he has a special warning call that cannot be overheard. During breeding season, he sings such melodious songs each morning before the sun rises and each evening until it is dark. That is his way of marking his territory. When the conditions are right, he and his partner bring 2 sets of young birds each year. It was early morning during summer and the weather was unsure what it was going to be like. There is a special feeling in the air at this time of the day. It is quiet and peaceful. This male blackbird was sitting in the tree and from this position, he was keeping watch over his territory. He normally sings beautiful songs but for the moment he seemed to be enjoying the serenity, too. This pretty blackbird female can now enjoy herself a moment of peace on the fence after a busy year of raising young ones. 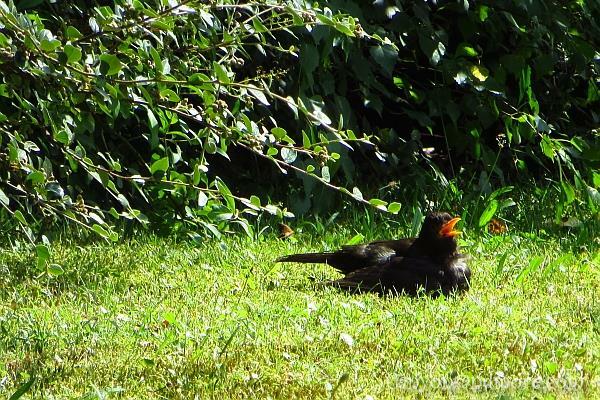 On a hot summer’s day, the blackbird decided to make himself comfortable on the green grass and soak up the warmth of the sun. He had his beak wide open the whole time. When birds want to freshen up the feathers, then it is done with a lot of splashing. They are so quick in their movements and almost seem acrobatic. Quite often the process takes up to 5 minutes and it is really fun to watch them. 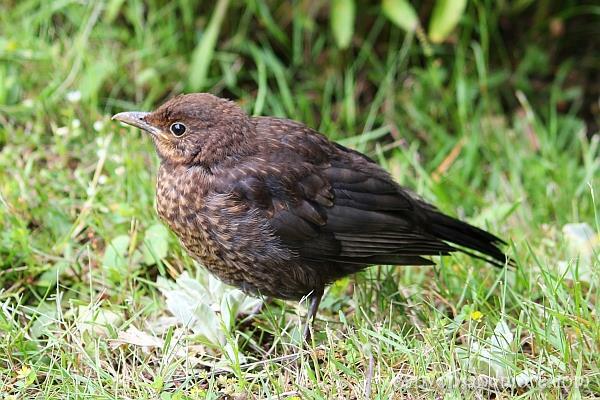 Every spring one can enjoy seeing the young blackbirds hopping around the yard. There is something so cute and innocent about them. 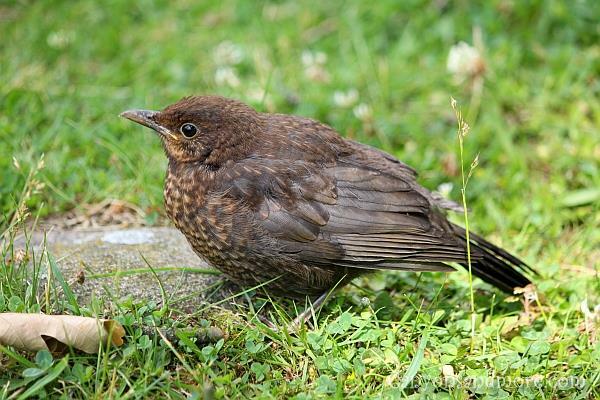 This young bird was stable enough the leave the nest yet young enough so that the parent blackbirds still have to keep watch over it. The parent birds show the little ones how to find food which usually consists of rainworms, bugs and berries. Sometimes one may think that the little ones are abandoned, but the parent birds are close by. A view out of the kitchen window of a cute juvenile blackbird exploring his world. Nope, this twig of leaves is definitely nothing to eat. 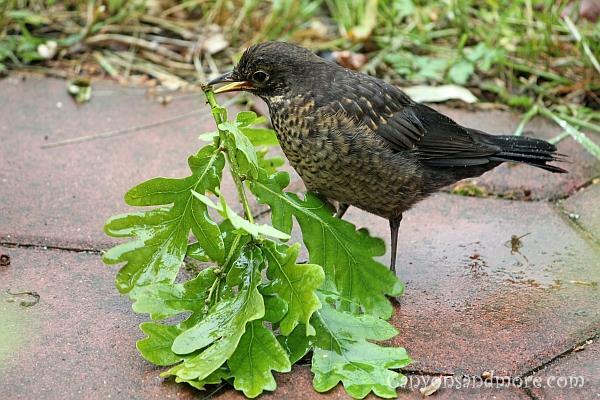 A young European Blackbird discovering the yard. Its parents were keeping watch over it from a fence.